There’s More to Intelligence than an IQ! 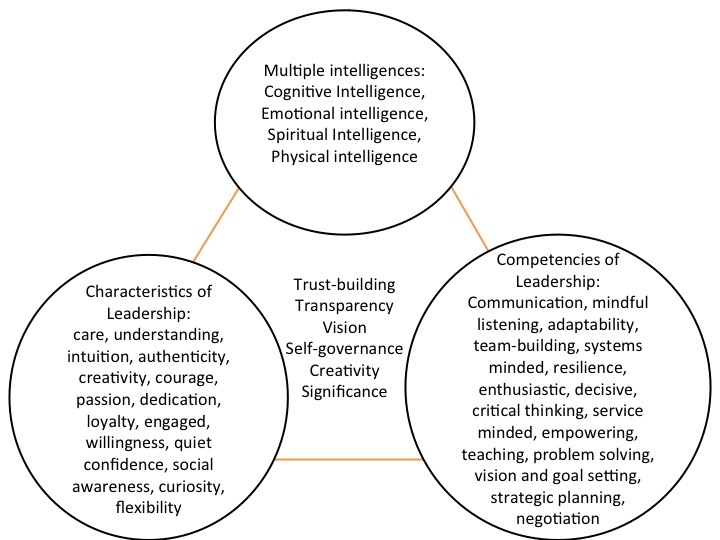 Last week, we answered the paramount question: “Who am I as a leader?” We took time to distinguish between the Characteristics and Competencies of leadership, and touched on the connection to Multiple Intelligence Theory. In this post, we’ll define and explore the application of the Four Intelligences. At the end of this post, you will be able to identify each intelligence in others, and more clearly understand how they connect to your self-awareness and development as a leader. Recall the old saying, “Body, Mind, and Spirit.” For many of us, this concept describes the different parts of our life. We may spend our time reaching for balance and fulfillment in all three categories in order to achieve happiness. Our concept of Four Intelligences is based on the Multiple Intelligence Theory of Howard Gardner. Leadership and business consultants like Cindy Wigglesworth take the “Body, Mind and Spirit” adage to the next level and assert that human intelligence is grouped into four distinct categories. We’ll use Wigglesworth’s Physical, Spiritual, Emotional, and Cognitive Intelligences as the framework for our discussion. Remember the Competencies and Characteristics we fondly dubbed Cs and Cs in our last post? Think of the Four Intelligences as four compartments of your leadership toolbox. Your Cs and Cs are the nuts and bolts that fit into each compartment. While leading others, we often pursue complex concepts. We may be involved so fully in the task at hand that we fail to realize the opportunity to fully engage our true potential. Understanding what you carry in your personal Intelligence Toolbox can be a valuable framework to help develop your leadership strengths and recognize areas that might need some work. Read the definitions below, and take the opportunity to test your own intelligences after each section. With your newfound knowledge, we will prepare to analyze the story of Mark, a real leader facing profound challenges in his organization. This is the intelligence we are most familiar with. It measures a person’s ability in the areas of logical thinking, the understanding of language, and the understanding of multiple concepts and perspectives. It has long been assumed by many that if you possess a high IQ, you will be more likely to secure better employment and more financial success relative to someone with a lower IQ. Although cognitive skills are extremely important, I strongly believe that they represent only one of the intelligences necessary for successful and fulfilled individuals and leaders. How many “intelligent” individuals do you know that struggle personally or professionally due to their lack of skills in building and managing relationships? Chances are, it’s more than a few. An individual with a high EQ will be able to identify emotions in himself and in others, and will possess the ability to control his emotions and impulses. He has a knack for inspiring and influencing others, and keenly understands social networks and the emotions surrounding relationships. As a leader operating with a strong base of Emotional Intelligence, the inherent characteristics of empathy, understanding, authenticity, and loyalty are buoyed by the learned competencies of mindful listening, problem solving, strong communication, and negotiation skills (just to name a few!). Physical Intelligence is our ability to maintain our physical fitness and overall wellness. Being a leader is a demanding job! It is important that we care for our bodies much in the same way as an elite athlete would. When our bodies are operating at optimal levels, we become more skillful at reducing stress, increasing focus, and maintaining energy. With a healthy body as a foundation, I believe that we are more capable of fully engaging the characteristics of dedication and commitment and displaying the competencies of resilience and decisiveness. Support your PQ with this tool! For me, SQ has been a lifelong area of exploration.I was raised with a strict understanding of “spirituality” which was directly associated to religion. Though my family’s traditional faith was rooted in fundamental beliefs that I hold dear to this day, I still felt as if something was missing. Back then, what I longed for was a spiritual approach that was grounded in the principle of inclusivity; both non-judgmental and accepting of the individual traits that make us unique. I also wanted a deeper connection to a sense of purpose and meaning. Although I’ll readily admit to being a work in progress, I have come to realize that through leadership, I have been able to actively apply the spiritual approach that I was seeking personally. My “spiritual intelligence” journey has helped me to identify compassion, care, and curiosity as the major leadership characteristics that I attempt to embody each day that I spend influencing others. With the desire to strengthen and further apply my spiritual intelligence, I have actively tried to develop the competencies of active listening, adaptability, and service-mindedness. The application of Spiritual Intelligence to leadership is a new frontier for many of us. It is not an easy concept and can be incredibly challenging to grow in today’s business environment. Continue the journey. The possibility of fulfillment and a clear sense of purpose for our teams are worth the investment. Learn more about Cindy Wigglesworth and SQ here! As you learned about the Four Intelligences, did you see right away where you are currently the strongest? Breaking down your Cs and Cs into the Four Intelligence Model is just one more step to better understand how to effectively utilize your strengths as a leader. Self-awareness can lead to both professional development and personal growth – they are not mutually exclusive! When we function at our highest potential, we are able to truly serve as the best leaders possible. The diagram below illustrates the possibilities of trust building, collaboration, and innovation in our organizations when we tap into our core values and display them in our actions. Next Steps: Identify an area that you want to work on and develop an action plan to track your progress. The Internet can be a great resource to help you navigate your journey, and I would also be happy to point you in the direction of books and articles that could serve as guides. Next time we’ll explore a real leader’s story and analyze his strengths, characteristics, and competencies as they relate to the Four Intelligences. Until then, continue to explore your leadership toolbox, and… lead on! Such a great blog, speaking about leadership and developing it ! I just love it! I wish I have seen this blog earlier it has some great articles ! Continue to inspire us ! !